In our previous article in the series, we showed you how to prepare the traditional hummus in your kitchen with simple ingredients found in most Indian kitchens. But how about adding a twist to the traditional hummus? 1. Roasted Garlic: Add a big ladle of roasted garlic to your traditional hummus, and you have an extra garlicky taste that many people love! 2. 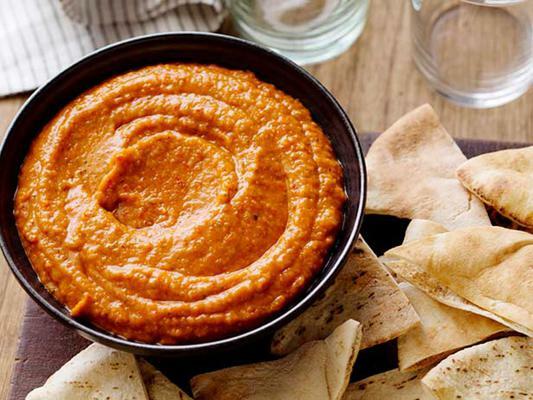 Roasted Red Peppers: This will not only change the colour of your hummus, but will also give a distinctive taste to it. 3. Chilli Chutney: Make a thick chutney out of red chillies, tomatoes and garlic. Add a generous ladle to the hummus and you have a hotter and yummier version! 4. Go Green: Adding fresh mint and corander will give a different taste to the traditional hummus. 5. California Twist: Just throw in some sun dried tomatoes and fresh basil for a different version. These are 5 tried and tested versions of the humble Hummus. There's nothing to stop you from trying out a new version with ingredients of your choice. If you come up with something worth sharing, use the comments section below! #DeepVeer Finally Tie the Knot in Italy! A Museum for Indian Recipes is on the Cards! The best version of Hrithik Roshan comes out with kids! Amitabh Bachchan to star in Hindi version of Bengali film 'Poshto'?